Like many hamlets since swallowed up in an burgeoning metropolitan area, Bethesda’s roots are rather humble. A typical outlying settlement, Bethesda began life as a small collection of buildings alongside a busy road that had once been a Native American trail. The town’s viabiliy was cemented in the early nineteenth century when the thoroughfare was converted into a toll road called the Washington and Rockville Turnpike, transporting tobacco and other commodities between Georgetown and Rockville, and up to Frederick. Around the toll and a solitary store, a small settlement grew up that would one day become Bethesda. 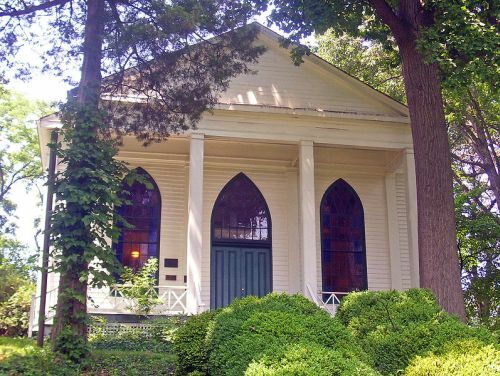 Originally named “Darcy’s Store” after local business owner William E. Darcy, the growing town acquired its definitive name in 1871 when postmaster Robert Franck named it after the Bethesda Meeting House, a Presbyterian church built in 1820. The church burned down in 1849 but was rebuilt the same year on an adjacent site, where it stands to this day. The church in turn took its name from the biblical Pool of Bethesda in Jerusalem, a place associated with healing. In ancient Greek manuscripts, the name of the Pool is often mistaken for that of the New Testament town Bethsaida, described as a “desert place” and believed by scholars to be the possible location where Jesus fed the five thousand. The origin of the church’s name has led to a common misconception that the town took its name directly from the Pool of Bethesda. Many villages grew up around crossroads – mini hubs where travelers congregated before continuing in their various directions – and Bethesda was no different. Straddling a crossroads for most of the nineteenth century, the town was little more than a blacksmith, post office, church, school, some houses and a few stores. But that was set to change after the turn of the twentieth century, when the newly installed streetcar line connected Bethesda to the nearby District of Columbia. This enabled suburbanization to take a hold, with the neighborhoods of Battery Park, Woodmont, Drummond and Edgemoor springing up on farmland adjacent to the turnpike. Well-to-do men like Merle Thorpe built mansions in fine grounds and help found the Woodmont Country Club – now on land occupied by the National Institutes of Health (NIH). Thorpe’s home, Pook’s Hill, accomodated the exiled Norwegian Royal Family during World War Two. Pook’s Hill was inspired by Rudyard Kipling’s 1906 story, Puck of Pook’s Hill. Puck was the mischievous sprite of English folklore also known as Robin Goodfellow, who is thought to have lent his name to the popular outlaw Robin Hood – or Robin of the Greenwood. Nevertheless, it is a fun pagan injection into Bethesda’s otherwise biblical heritage. The rapid expansion of government during World War Two correlated to a rapid expansion of Bethesda, with the National Naval Medical Center (1939) and NIH (1953) built north of the downtown. As a result, medical professionals, government contractors and business people have flocked to the area. Bethesda has since become the core employment hub of southwestern Montgomery County, with many of its workers traveling from Washington, DC and vice versa. Major companies headquartered here today include defense giant Lockheed Martin, Mariott International, Honest Tea and Ritz Carlton. Opened as the Boro Theatre (name changed only a year later) on May 19, 1938 to a screening of Bluebeard’s Eighth Wife, starring Gary Cooper and Claudette Colbert, it soon became a local landmark/community hub and remains one of the few remaining Art Deco cinemas in the Greater DC Metro area. At the time it was built, it represented the cutting edge of technology and comfort. 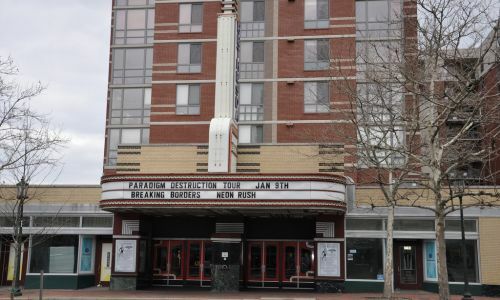 Remaining in that role for more than four decades, in 1983 it was converted to a film and food venue known as the Bethesda Cinema ‘N Drafthouse, then later the Bethesda Theatre Cafe in 1990. 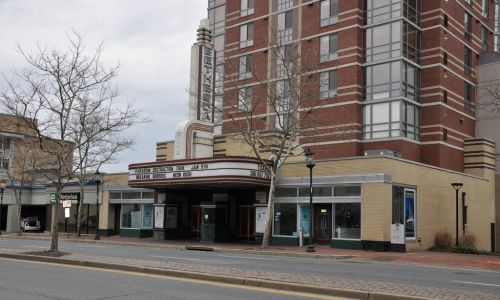 Placed on the National Register of Historic Places in 1999 and restored to its former glory, thanks to the Bethesda Cultural Alliance, the old cinema is now a theater showing intimate Off Broadway productions and cabaret-style shows. Great building! For more info on shows, history and old pictures, check out the theaters official website. And despite being pretty small, its fashionable Deco lines help it hold its own against the towering building behind!